We created unique glass awards for the Ali Center for the center’s Humanitarian awards. 6 Flame awards were created highlighting the 6 core principles of Ali’s life. We created larger blue vessels that are then given to individuals that have made significant Humanitarian contributions. There is a lifetime award, Humanitarian of the year, and a Kentucky Humanitarian award. All of the awards incorporate Muhammad Ali’s thumbprint. 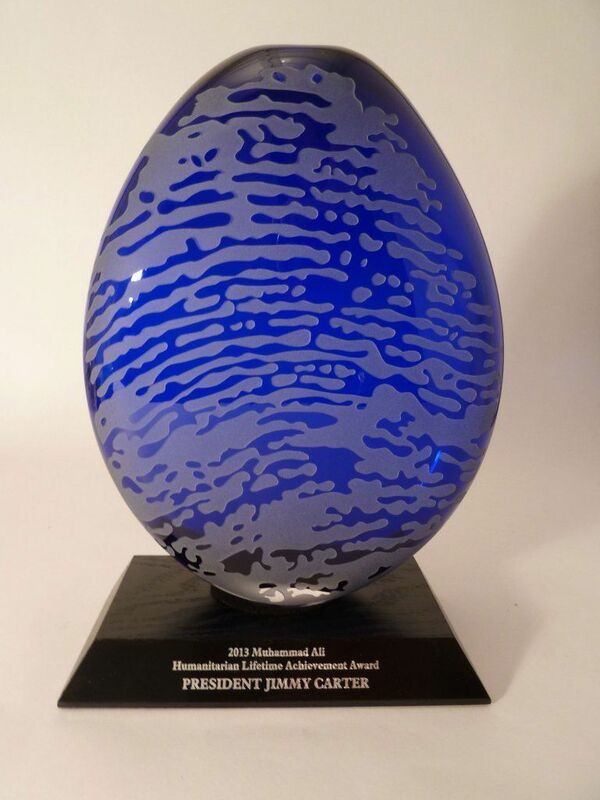 On the smaller awards there is a lifesize engraving of his thumbprint. On the larger vessels the thumbprint is enlarged to be more of an abstraction and it covers the entire surface of one side of the form. The thumbprint design represents Ali’s mark and lasting imprint that he has made on the world and directly on so many individuals in his life.